Cooper's proven, class-leading 3-ply “Armor-Tek3®” construction contributes to the durability of the S/TMAXX by adding strength to the sidewall and tread area. A unique angled ply construction absorbs and helps dissipate tire impact forces that can damage a tire in harsh off-road conditions. The alternating 4-5-rib tread pattern gives the S/TMAXX a bold look, while providing enhanced on- and off-road performance. The pattern geometry and internal siping provide an optimized blend of all-season and off-road traction performance. The 4-5-rib tread element design of the S/TMAXX randomizes tread block impacts with the road surface resulting in remarkably low noise for a tire of its class. The tread compound is formulated with a unique blend of natural rubber and silica that provides exceptional wet traction and confident handling on the highway, while also delivering excellent cut and chip resistance on unpaved, rocky and gravel terrain. The micro-gauge sipes in the tread provide increased tread block rigidity and vehicle stability while reducing the potential for stone retention and stone drilling into the tread elements. The rounded corners reduce stress concentrations to enhance crack and tear resistance of the tread blocks. The optimized tire profile is designed to improve on-highway handling characteristics and promote reliable, long and even treadwear. The asymmetric and dual draft angles along the tread element walls aid in reducing stone retention and stone drilling and increases their resistance to cutting and chipping when used in gravel or off-road applications. Strategically placed ribs within the lateral grooves of the tread design help to discharge stones and resist stone drilling. Wide, lateral grooves and offset circumferential grooves provide excellent and consistent off-road traction. The optimized design of the buttress area provides additional off-road traction, abrasion and puncture resistance. Its rugged design minimizes the potential for damage due to scrapes and abrasion when used in difficult terrain. Nylon is strategically positioned and applied in a manner to resist flat spotting for improved ride quality and more balanced treadwear for longer tread life. 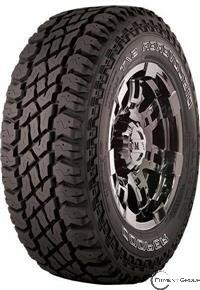 The large surface-area tread elements provide positive grip and even wear for excellent on- and off-road performance. The combination of the engineered tread pattern and computer optimized pitch sequence helps create low tread pattern noise for a quieter ride. A continuous rut guard rib is strategically placed in the upper sidewall area of the tire, to deflect objects and provide for increased abrasion resistance in tough, uneven terrain. Self-cleaning, alternating shoulder scallops give the S/TMAXX a more aggressive look while providing additional off-road traction capabilities. A raised rubber rib at the rim edge helps prevent damage to rims and reduces debris from lodging between the rim and tire. Raised ribs in the center of the tread pattern generate additional tread edges as the tire wears, providing for consistent traction performance throughout the life of the tire. In addition, the ribs provide an added barrier to rock penetration and damage.